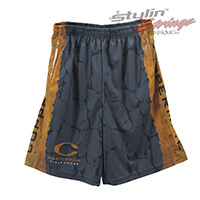 The Coppermine Fieldhouse copper sublimated performance shorts were designed to match the vibe of the corporate logo & facility in Towson Maryland. The body of the shorts was ghosted with a rock tecture. The side panels were designed with an all copper plate color & texture with word mark logo laid on top.